Cyprus is one of the oldest wine producers in Europe, with a recent archaeological discovery dating the first wine production nearly 6000 years ago to 3500 BC and ranks 50th in the world, this makes wines of Cyprus popular among wine lovers with many local award winning wines and some of them being among the oldest wines in the world still being produced. Most Cyprus wine is made from indigenous grape varieties. White wine comes mainly from the Xynisteri grape which produces a fresh, crisp white, best drunk young. Red wine is made from a variety of local grapes such as Mavro, Opthalmo and the unique tasting Maratheftiko. Whilst most red wines are also best drunk when young, more mature wines are now being produced, blended with other grape varieties such as Cabernet Sauvignon or Mataro and aged in oak casks. However, Cyprus famous wine is Commandaria , some people say it is the world’s oldest wine. In 1191 King Richard I (called the Lionheart) departed on the Third Crusade. He passed Cyprus on the way to the Holy Land and he conquered the island which was later purchased by the Knights Templar. The Knights settled on a place on the island that they called Commandaria. The local wine was given the same name. 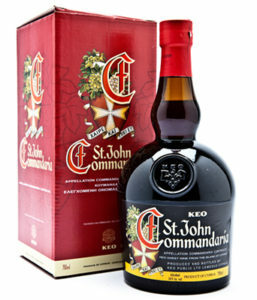 Of course, the popularity of Commandaria has waned a bit over the years. But its reputation as one of the classic, sweet wines of the world has never disappeared. The wine is made from two local grapes, the blue grape mavro blue and the white xynisteri. The grapes are grown on the southern slopes of the Troodos Mountains, about 30 kilometers north of Limassol, in poor volcanic soil. 14 villages are entitled to make Commandaria. Commandaria wines have the sweetness, the richness and the caramel aromas in common. Some of them are almost overwhelming. To be enjoyed as an after dinner drink or with a chocolate dessert. Or whenever you feel the need for an energy boost.